Advertising Director oversees various campaigns and projects that are launched by the company. The job description of these directors may vary upon the employment setting, but the commonly mentioned tasks in the Advertising Director Resume include – directing advertising strategy, budget management, contract negotiations, carrying out interdepartmental communications, approving concepts, recruiting and training staff, collaborating with other departments in preparing upcoming advertising campaigns and inspecting the final copies such as print ads, commercial scripts, and videos. 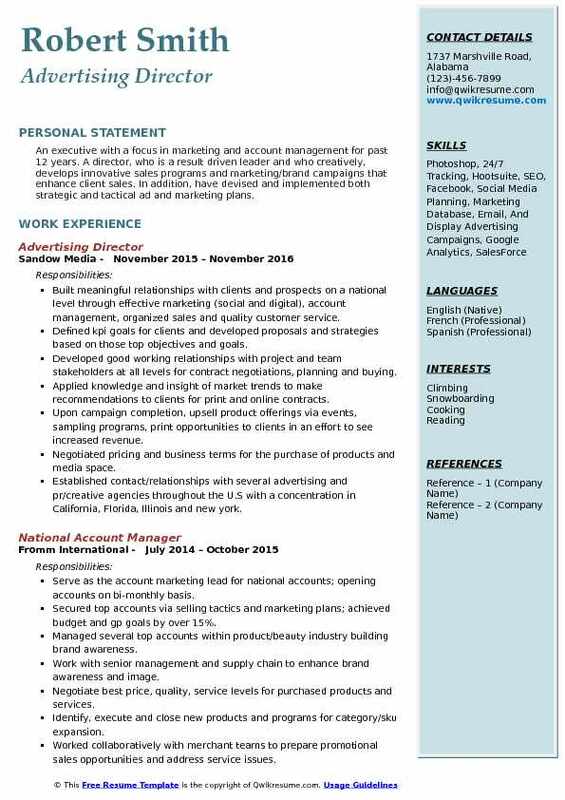 Ideal candidates should be able to mention in the resumes attributes such as – advertising expertise, knowledge of various media channels, experience in effective advertising campaigns, a high-end knowledge of digital marketing, working knowledge of analytics tools and the ability to manage and compile data. Education requirements may vary, but most of the advertising directors have a degree in the field of advertising, journalism or marketing. 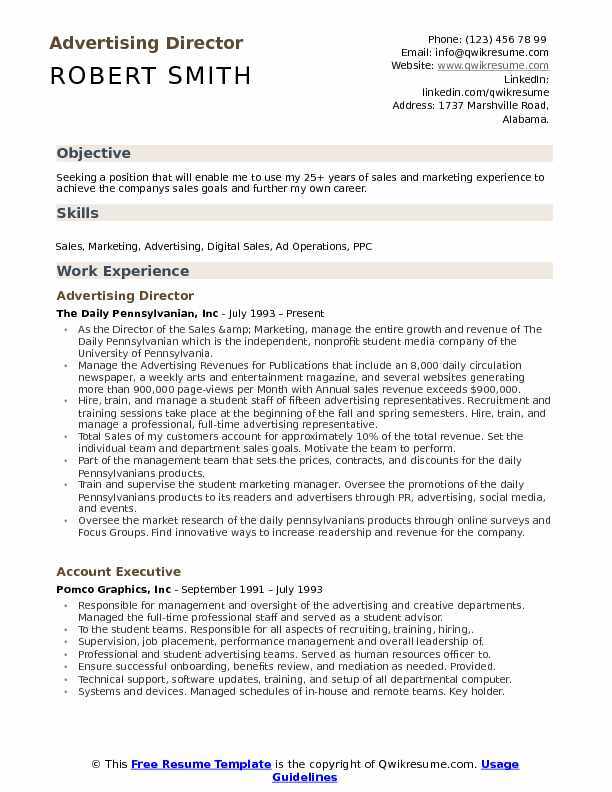 Summary : Seeking a position that will enable me to use my 25+ years of sales and marketing experience to achieve the companys sales goals and further my own career. As the Director of the Sales & Marketing, manage the entire growth and revenue of The Daily Pennsylvanian which is the independent, nonprofit student media company of the University of Pennsylvania. Manage the Advertising Revenues for Publications that include an 8,000 daily circulation newspaper, a weekly arts and entertainment magazine, and several websites generating more than 900,000 page-views per Month with Annual sales revenue exceeds $900,000. 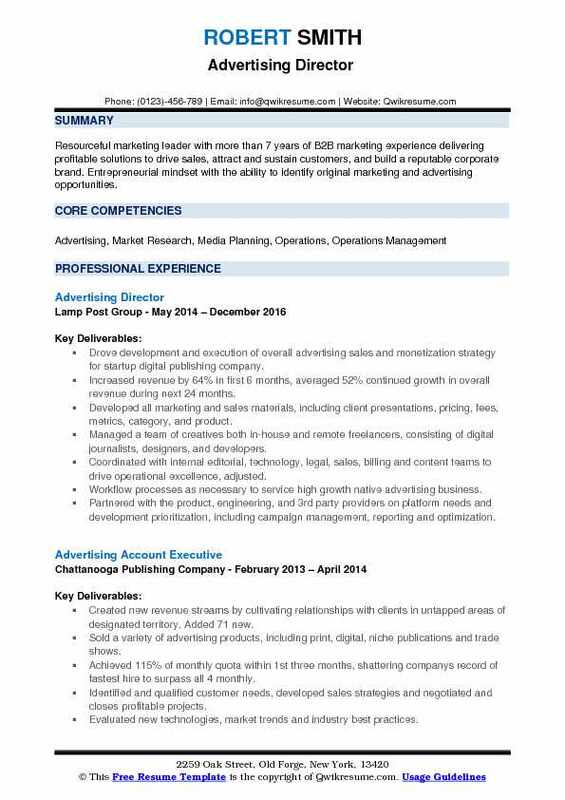 Hire, train, and manage a student staff of fifteen advertising representatives. Recruitment and training sessions take place at the beginning of the fall and spring semesters. 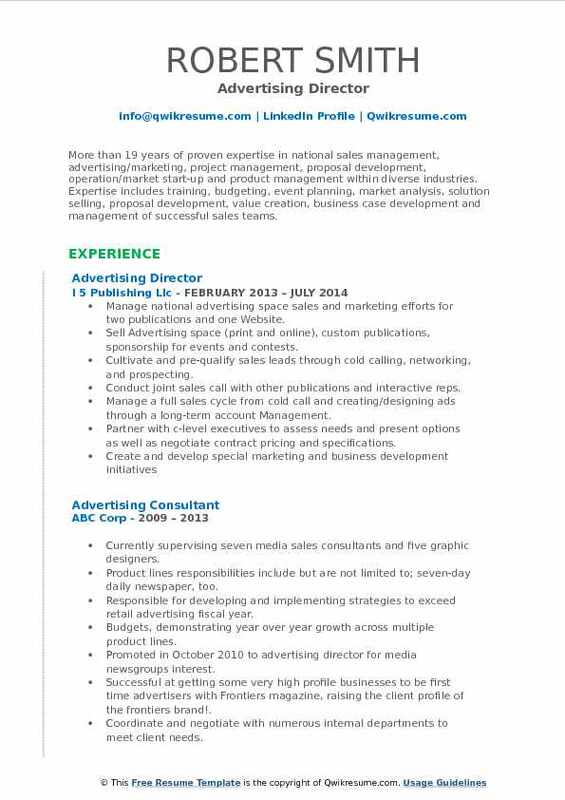 Hire, train, and manage a professional, full-time advertising representative. Total Sales of my customers account for approximately 10% of the total revenue. Set the individual team and department sales goals. Motivate the team to perform. Part of the management team that sets the prices, contracts, and discounts for the daily Pennsylvanians products. Train and supervise the student marketing manager. Oversee the promotions of the daily Pennsylvanians products to its readers and advertisers through PR, advertising, social media, and events. Oversee the market research of the daily pennsylvanians products through online surveys and Focus Groups. Find innovative ways to increase readership and revenue for the company. Headline : Resourceful marketing leader with more than 7 years of B2B marketing experience delivering profitable solutions to drive sales, attract and sustain customers, and build a reputable corporate brand. Entrepreneurial mindset with the ability to identify original marketing and advertising opportunities. Drove development and execution of overall advertising sales and monetization strategy for startup digital publishing company. Increased revenue by 64% in first 6 months, averaged 52% continued growth in overall revenue during next 24 months. Developed all marketing and sales materials, including client presentations, pricing, fees, metrics, category, and product. Managed a team of creatives both in-house and remote freelancers, consisting of digital journalists, designers, and developers. Coordinated with internal editorial, technology, legal, sales, billing and content teams to drive operational excellence, adjusted. Workflow processes as necessary to service high growth native advertising business. Partnered with the product, engineering, and 3rd party providers on platform needs and development prioritization, including campaign management, reporting and optimization. Summary : Aggressive, Results Driven Advertising Sales Professional with over 25 years in the publishing industry and a documented record of increasing market share and surpassing sales goals. Excellent sales & marketing skills that include thorough product knowledge and the ability to convey all pertinent facts to customers, staff, and management. Recruited to manage and develop the sales team of 14 and special projects editors. Budget and strategize to increase revenue year-over-year and achieve the departments print, digital and niche publication initiatives. Launched savvy. Mn magazine developed monthly and annual events and grew highly engaged audience through print, digital and social media platforms. Implemented multiple successful sales contests that improved staff morale and stimulated non-traditional sales. Assisted in streamlining retail niche publication sales with direct involvement with product content, design and sales strategy. Developed relationships with key community leaders to produce and sell chamber directories and visitor publications. Lead marketing team and develop promotional strategies for all publications. Implemented advertising sales tool ask (advertising sales calculator) to leverage multi-product packages for overall increased revenues. Oversee local classified sales team, develop and research new strategies for all red wing publishing divisions. Create advertiser events and marketing opportunities to grow revenue and gain exposure for digital agency big fish digital. Participated in research and implementation of outsourcing of graphic design efforts. Summary : More than 19 years of proven expertise in national sales management, advertising/marketing, project management, proposal development, operation/market start-up and product management within diverse industries. Expertise includes training, budgeting, event planning, market analysis, solution selling, proposal development, value creation, business case development and management of successful sales teams. Manage national advertising space sales and marketing efforts for two publications and one Website. Sell Advertising space (print and online), custom publications, sponsorship for events and contests. Cultivate and pre-qualify sales leads through cold calling, networking, and prospecting. Conduct joint sales call with other publications and interactive reps. Manage a full sales cycle from cold call and creating/designing ads through a long-term account Management. Partner with c-level executives to assess needs and present options as well as negotiate contract pricing and specifications. Responsible for regular trade and consumer show representation, presentations and networking. Headline : An executive with a focus in marketing and account management for past 12 years. A director, who is a result driven leader and who creatively, develops innovative sales programs and marketing/brand campaigns that enhance client sales. In addition, have devised and implemented both strategic and tactical ad and marketing plans. Built meaningful relationships with clients and prospects on a national level through effective marketing (social and digital), account management, organized sales and quality customer service. Defined kpi goals for clients and developed proposals and strategies based on those top objectives and goals. Developed good working relationships with project and team stakeholders at all levels for contract negotiations, planning and buying. Applied knowledge and insight of market trends to make recommendations to clients for print and online contracts. Upon campaign completion, upsell product offerings via events, sampling programs, print opportunities to clients in an effort to see increased revenue. Negotiated pricing and business terms for the purchase of products and media space. Established contact/relationships with several advertising and pr/creative agencies throughout the U.S with a concentration in California, Florida, Illinois and new york. Coordinated, led and met with the internal team to strategize on each project basis resales contracts, print, social media campaigns, landing pages and optimize user experience. Following contract execution, remained involved if additional contracting needs arise or terms of the contract are not being met. Implemented rebate incentive and marketing programs with key stakeholders to earn additional revenue. Pioneered the organizations cross-promotion marketing programs for top clients, heightening the publications visibility. Summary : 30+ years in general management roles in the media businesses and responsible for invention, marketing, sales, client relations, public involvement, operations and strategic development. Responsible for all advertising contract negotiations for two high-end magazines. Served as liaison between client and designer as well as designer and creative director. Responsible for maintaining agency-client relationships while actively seeking new clients. Exhibited leadership. Educated and sold customers on multi-media marketing options to promote business growth and brand awareness. 80% cold calling for new business development. Researched potential customers and proactively sourced opportunities for account growth. Oversaw advertising. Worked creatively helping the client with the actual design and development of their print and online advertising with the graphics department to maximize the advertising effectiveness of clients campaign. Managed the sales process from beginning to end - from prospecting to proposal & presentation, close, campaign implementation (in conjunction with digital and print ad ops) through post-campaign analysis. Sold vendor opportunities at special events and parties to promote the frontiers brand. 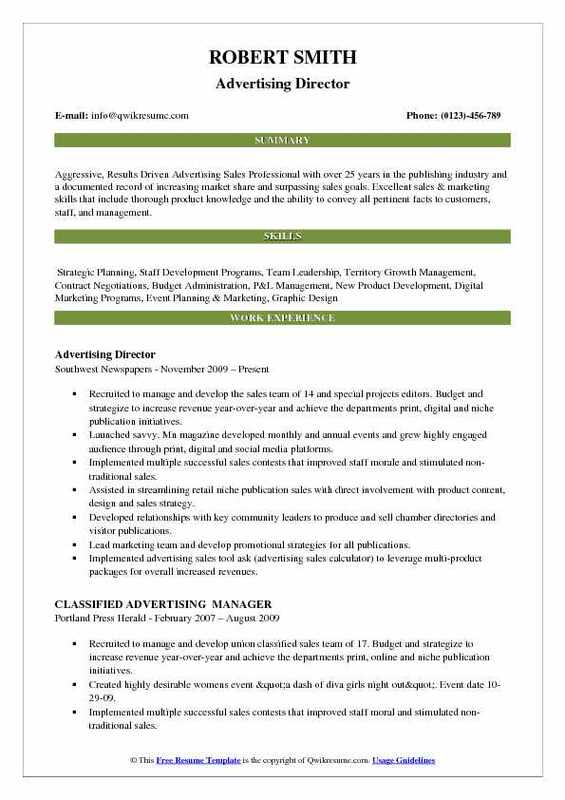 Summary : Senior Advertising and Sales Professional with 20+ years experience managing advertising departments at local, regional media companies. Skilled project manager, sales trainer, team builder with expertise in development, budgeting, and implementation of advertising plans, including entries into previously untapped areas. 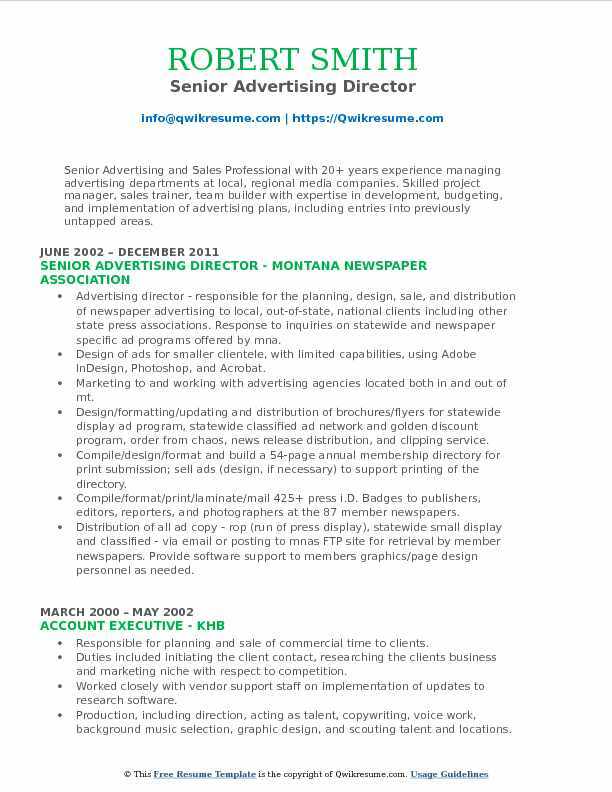 Advertising director - responsible for the planning, design, sale, and distribution of newspaper advertising to local, out-of-state, national clients including other state press associations. Response to inquiries on statewide and newspaper specific ad programs offered by mna. Design of ads for smaller clientele, with limited capabilities, using Adobe InDesign, Photoshop, and Acrobat. Marketing to and working with advertising agencies located both in and out of mt. Design/formatting/updating and distribution of brochures/flyers for statewide display ad program, statewide classified ad network and golden discount program, order from chaos, news release distribution, and clipping service. Compile/design/format and build a 54-page annual membership directory for print submission; sell ads (design, if necessary) to support printing of the directory. Compile/format/print/laminate/mail 425+ press i.D. Badges to publishers, editors, reporters, and photographers at the 87 member newspapers. Distribution of all ad copy - rop (run of press display), statewide small display and classified - via email or posting to mnas FTP site for retrieval by member newspapers. Provide software support to members graphics/page design personnel as needed. 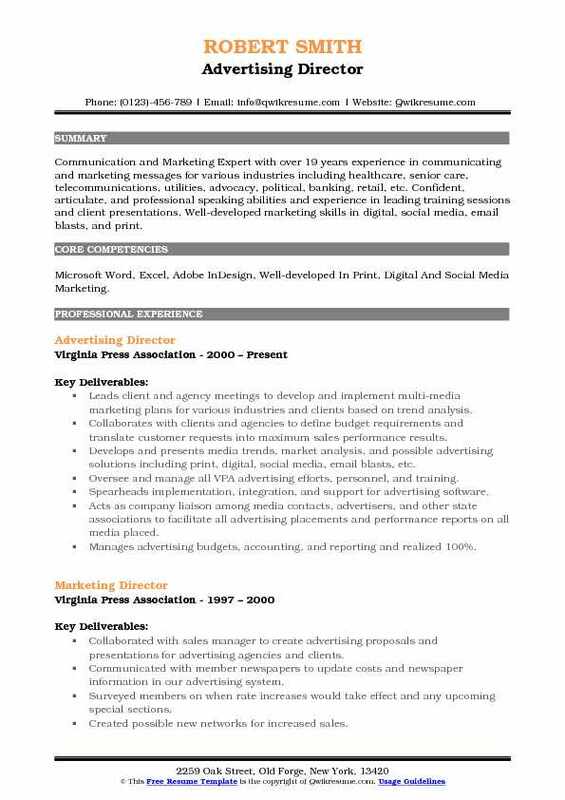 Summary : Communication and Marketing Expert with over 19 years experience in communicating and marketing messages for various industries including healthcare, senior care, telecommunications, utilities, advocacy, political, banking, retail, etc. Confident, articulate, and professional speaking abilities and experience in leading training sessions and client presentations. Well-developed marketing skills in digital, social media, email blasts, and print. 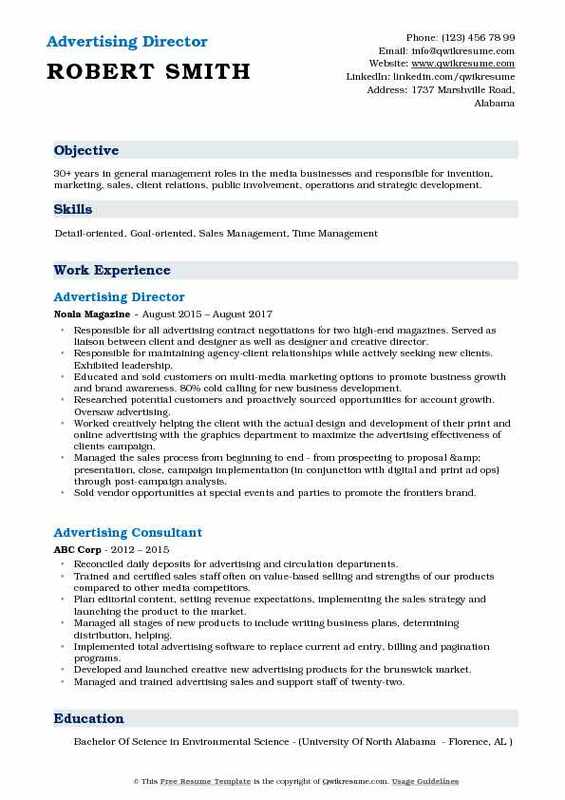 Skills : Microsoft Word, Excel, Adobe InDesign, Well-developed In Print, Digital And Social Media Marketing. Leads client and agency meetings to develop and implement multi-media marketing plans for various industries and clients based on trend analysis. Collaborates with clients and agencies to define budget requirements and translate customer requests into maximum sales performance results. Develops and presents media trends, market analysis, and possible advertising solutions including print, digital, social media, email blasts, etc. Oversee and manage all VPA advertising efforts, personnel, and training. Spearheads implementation, integration, and support for advertising software. Acts as company liaison among media contacts, advertisers, and other state associations to facilitate all advertising placements and performance reports on all media placed. Manages advertising budgets, accounting, and reporting and realized 100%. Assists with all association conference and event planning, preparation and execution. Works in partnership with members to create new marketing tools and revenue streams. Objective : Accomplished and results-driven sales professional offers 25 years of leadership and account management experience as an integral part of fast-paced sales teams. Strategic thinker and proactive problem solver with expertise in consultative selling and territory sales management. Managed and lead ad sales team - supported all sales efforts including, sales strategy, methodology, guidance. Coordinated with the office manager and production on sales deadlines, created budgets and goals, developed and distributed account assignments & cold calling lists. Created comprehensive run lists & traffic logs in Zoho (CRM) database to include print & digital. Worked with billing department to secure contracts and payments from clients. Assisted editorial staff with editorial content to further sales opportunities. Provided assistance as needed with the publisher regarding non-profit and for-profit events/partnerships. Coordinated event sponsorship sales with the sales team and assisted with planning and production. Built relationships with prospective clients and managed an individual account list of over 500 clients. Individual book of business exceeded $350,000 for print, digital and online sales. Summary : Extremely talented goal driven client focused sales account management leader. Strong team building skills with proven ability to influence performance improvement. Proficient in all sales cycle phases from lead generation and presentation to negotiation, closing and follow up. Keen ability to forecast industry trends, capture opportunities, and catapult new ventures. 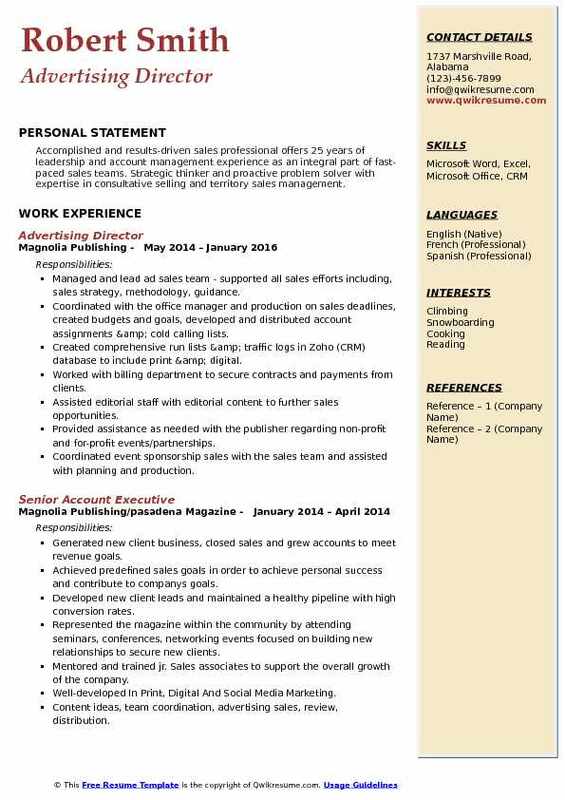 Skills : Skilled in multiple areas of magazine management, budgeting and fiscal management, marketing and business development. Spearhead key account development programs that target, penetrate and launch business growth throughout the northeast and west coast region. Oversee daily responsibilities of all business activity, exceed sales quotas by 15% throughout tenure generating over $25mm in revenue. 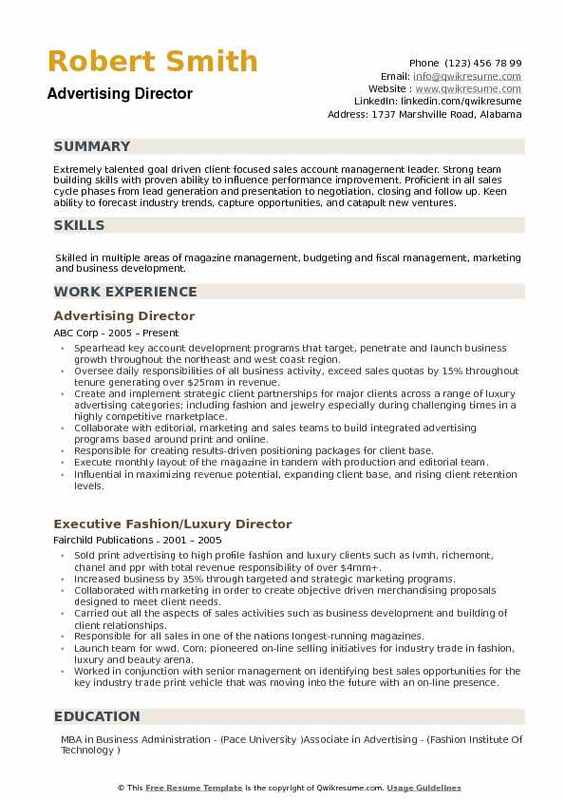 Create and implement strategic client partnerships for major clients across a range of luxury advertising categories; including fashion and jewelry especially during challenging times in a highly competitive marketplace. Collaborate with editorial, marketing and sales teams to build integrated advertising programs based around print and online. Responsible for creating results-driven positioning packages for client base. Execute monthly layout of the magazine in tandem with production and editorial team. Influential in maximizing revenue potential, expanding client base, and rising client retention levels. Establish goals and category strategies for the sales of the magazine. Lead customer business development that helps in optimizing revenue potential.